The bellow questions and answers aim to provide You will more information about the specifics of the ESMA regulations which come into effect from the 1st August 2018. ESMA is the European Securities and Markets Authority, an independent regulatory institution with a mission to enhance investor protection and promote stable and orderly financial market in the European Union (EU). What are the new ESMA regulation measures introduced in 2018? Effective from 1st August 2018, ESMA has formally adopted new measures on the provision of CFDs to Retail clients. These measures can also be referred to as restrictions while they aim to further regulate the Financial Services market in the EU. The measures include average limits on opening positions, a margin close out rule on a per account basis, a negative balance protection on a per account basis, preventing the use of incentives by a CFD provider and a firm specific risk warning delivered in a standardized way. As a licensed and regulated institution, GBE brokers ltd. will adopt and follow the new regulations effective from 1st August 2018. What if You do not live within the European Union? The ESMA measures will apply to all Retail clients trading with GBE brokers ltd regardless of their country of residence. Will the ESMA regulation measures impact You? If You are trading as a Professional client with GBE brokers these measures will not impact You. However, if You are trading as a Retail client, Your maximum available leverage will be limited. Can a Retail client apply to be classified as a Professional? Yes. A Retail client can submit an “Elective Professional Application”, if the Retail client wishes to apply to become a Professional. GBE brokers ltd. will carry out an assessment of the Elective Professional Application and will respond back to the applicant. It will be at GBE brokers ltd’s absolute discretion to accept or reject an application, even if the criteria are fully fulfilled. What are the key criteria required to become a Professional client? You own a financial instrument portfolio (including cash deposits and financial instruments) exceeding EUR 500,000. You have trading experience of a significant size in CFDs, spread betting or forex at an average frequency of 10 times in each quarter of the last 4 quarters. You are working, or have worked in the financial sector for at least one year in a professional position, which requires knowledge of leveraged products, such as CFDs. What documentation do You need to submit to support Your Elective Professional Application? Copies of bank statements, share certificates, broker accounts or others that demonstrate deposits or investments with a total value of 500,000 EUR or more. Documents showing that You have worked in the Financial sector for over one year in a professional position requiring knowledge of leveraged products, such as CFDs. Evidence of trading activity of at least 40 significant transactions executed over the past year. These can be a mixture of such executed at GBE brokers and/or at another institution. Will You get negative balance protection as an elective Professional Client? Yes. GBE brokers offers Negative Balance Protection to both Retail and Professional clients. Please be aware that Professional clients waive various protections provided by the regulatory authorities. For more information on this matter please refer to GBE brokers ltd’s Client Categorisation Policy. Please ensure that You have fully read and understood all our terms before submitting an Elective Professional Application. What are the margin requirements for a Professional trader? Lets look at this example. 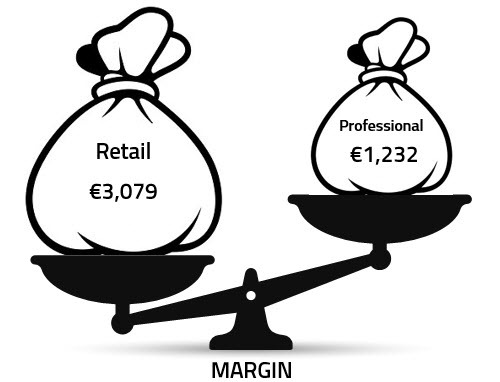 Retail client margin required in accordance with the new ESMA regulation will be €3,079. Professional client margin required will be €1,232. Where can I find the Elective Professional Application form? The Elective Professional Application form is available on MyGBE portal. If You wish to access the form please login to MyGBE portal and locate the Elective Professional Application button positioned on the left hand side menu under the Information & Tools section. Alternatively click on this link after You have first successfully logged in to MyGBE. Are the ESMA measures permanent? On the 1st June 2018 ESMA issued a publication on their website informing the public that the new measures “will remain in force for a period of three months from the date of application.” It is noted that the European law permits the institution to extend the measures for an additional 3 months period. Will the Demo account conditions change? Yes. GBE brokers demo accounts are in line with our live accounts and therefore the above measures will be applied to the demo environment for Retail traders. Can You change Your mind and return back to Retail client category? Yes. You are allowed to change Your mind even if we have already approved Your application. You can inform us in writing in case that You no longer wish to trade as an “Elective Professional” and GBE brokers ltd. will change Your classification back to “Retail”. Do the new ESMA measures apply to companies as well? 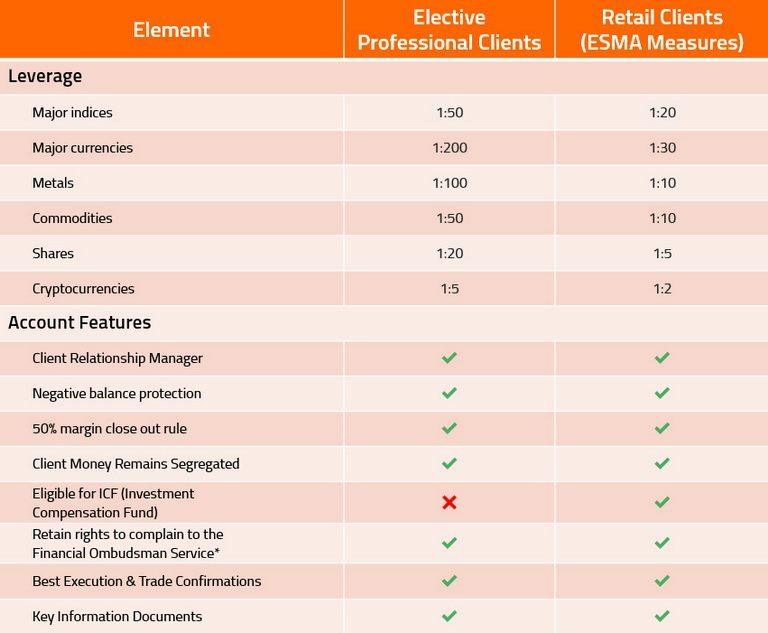 ESMA measures will apply to those companies who are categorized as Retail clients. Can a company submit an Elective Professional Application? Yes. Companies who are classified as Retail clients at GBE brokers are allowed to submit an Elective Professional Application.